Bukhara is famous for its architectures. But what was done as part of their destruction by Genghis khan, Tamerlane and other nomadic plunderers meant that little of old stuffs remained. However Bukhara still holds several of them at least in remains. 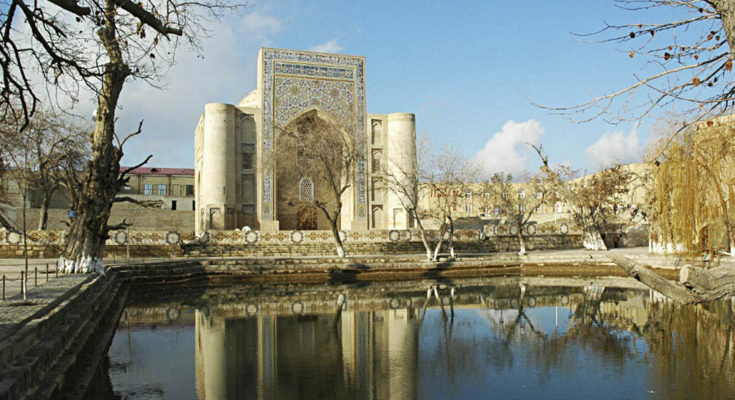 In this article also we will see one such place in Historical City of Bukhara, Uzbekistan. This is Lyab I Hauz. Lyab I Hauz is one surviving place of old times in Bukhara. 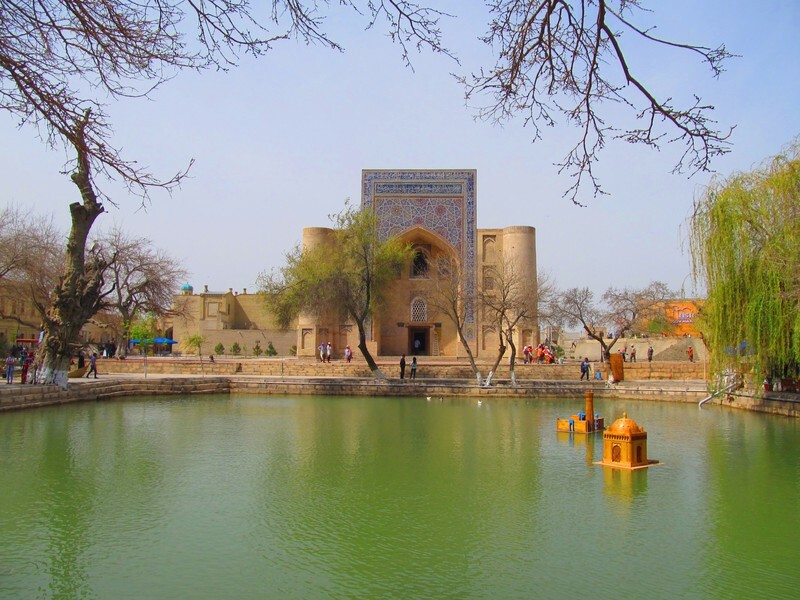 Lyab I hauz is the name of the area that surrounds one of the few remaining hauz (ponds) which survived through times in the city of Bukhara. Why this is one of the surviving Hauz? Because once until the Soviet period there were many such Hauzs but they were the prime reasons for spreading disease and were mostly filled during 1920s and 1930s. Lyab I Hauz survived because it is not a Hauz alone but a center piece of a magnificent ensemble which was created during the time of 16th and 17th centuries and it has not changed significantly since then. Lyab I Hauz deserves a visit once you are on a Bukhara tour or Uzbekistan tour. Let us know more about Lyab I Hauz. 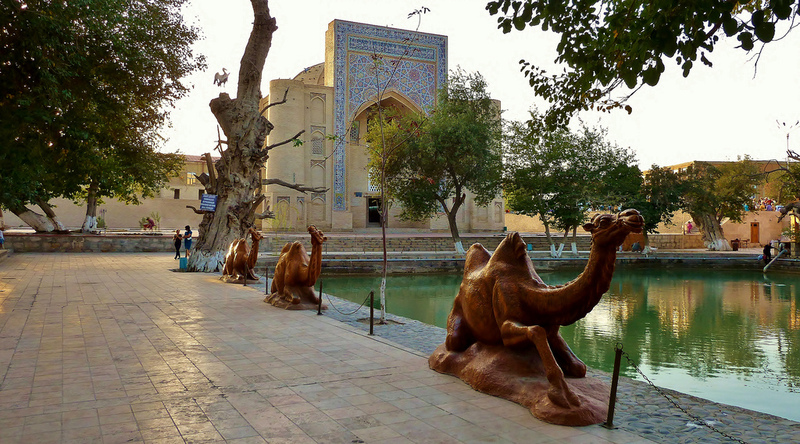 Lyab I Hauz is a charming plaza in Bukhara. It was built in 1620 and even today it is a pleasant place. Through the passage of time Lyab I Hauz has stood with its timeless quality. The Lyab I Hauz ensemble which surrounds the Hauz on three sides consists of Kukeldash Madrasah on the northern side of the Hauz and two other religious edifices, a Khanka and a Madrasha on the west side and east side. So Lyab I Hauz is a plaza that surrounds Bukhara’s last remaining Hauz. This was one of the main gathering places in old Bukhara. At this place old men spent hours at tea houses sitting on wooden platforms, they gossiped and played backgammon along with dominoes and card games. Young boys in their underwear took a leap into the water of Hauz. You find several of mosques around the edges of the square along with some religious schools. The buildings here were mostly built around 16th-17th centuries. One such unusual building is Nadir Divan Begi Nadrassah Madrasah on the east side of the square. 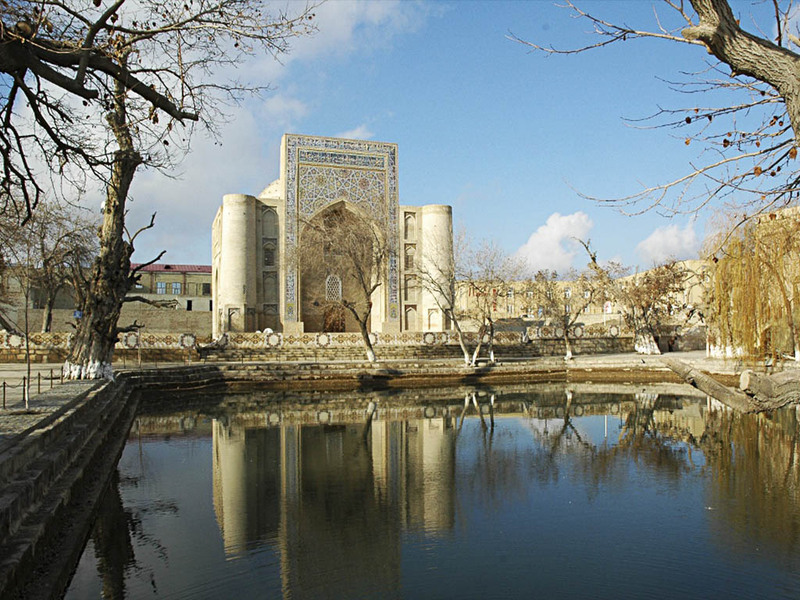 So there are ample of architectural beauty for you to admire at and around Lyab I Hauz in old town of Bukhara. You can walk around the Lyab I Hauz as there is plenty of things to do. You can find Kebab restaurants, brick steps, shops of carpets, mulberry trees and especially for women is psychedelic Uzbek dresses hawking souvenirs. You find covered Bazaars on the west and north side of Lyab I Hauz which are quite a busy place and full of shops, arcades and bustling narrow streets. In the central area you can see five dome covered buildings which was built in 16th century. It provides cool atmosphere to merchants for selling here. Today the form of the Lyab I Hauz is right angled and you will find the surrounding a busy area full of meaningful things for you. You should visit this place as the old remains. Walk through the narrow streets. Visit the mosques around and enjoy the pond as much as you can. Bukhara itself is a UNESCO world heritage site and this 2000 years old city has many fascinating old architecture representations. So you can enjoy one of the remains of old time Lyab I Hauz with surrounding mosques, streets and markets of 16th-17th centuries. It is only right to say that when you take Uzbekistan travel package next time and go to visit Bukhara do take time out to explore Lyab I Hauz in details.